I baked this cake for a friend’s birthday. 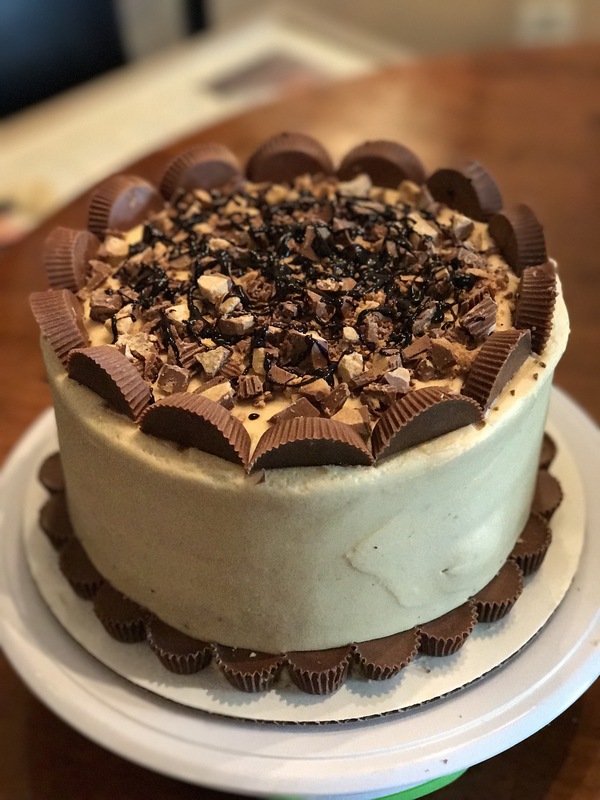 His girlfriend made the request/order (my third professional cake), and since he’s a relatively good friend who had always joked about me baking him a cake, I happily obliged. She asked for a smaller cake, but, because it was a birthday cake, I made the executive decision to upsize the order. Everyone should have a “big, big cake” for their birthday. This chocolate cake is one of my two go-to chocolate cakes (this is the other). I baked it previously on a whim in smaller form as this cake. It’s easy to prepare, has great chocolate flavor, and is incredibly moist. There was some leftover frosting that just couldn’t be wasted (you, know), and it was very good. I think the cream cheese makes it even more decadent than just a normal butter/shortening frosting. If the size of the cake was out-of-hand, the decorating was even more over-the-top. 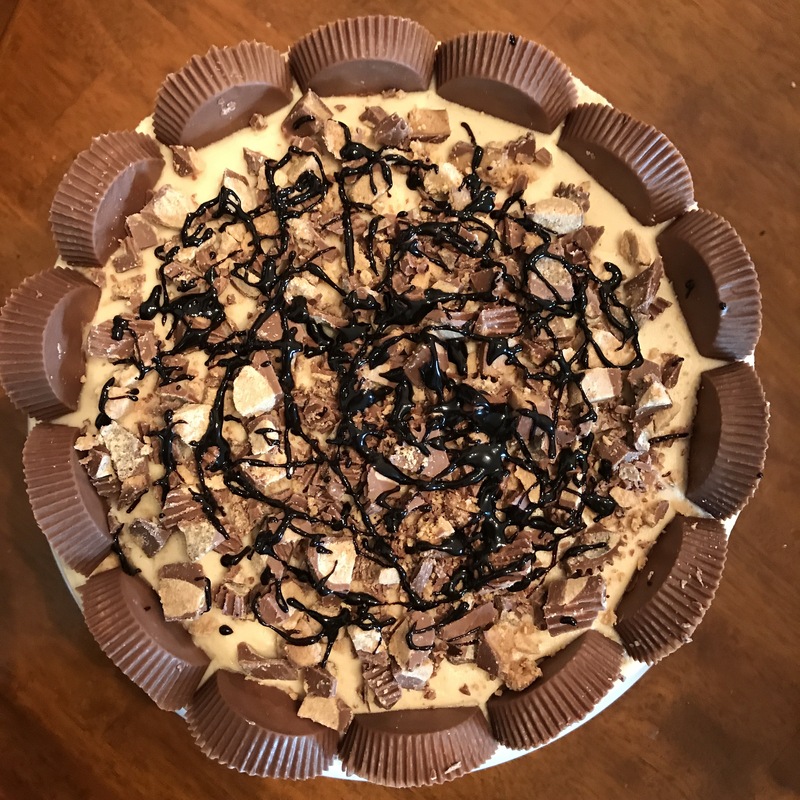 I split Mini Reese’s Peanut Butter Cups to adorn the bottom edge and cut regular Reese’s Peanut Butter Cups for the top edge. For the top of the cake, I chopped up the remaining Peanut Butter Cups and then drizzled some hot fudge sauce on top. I’m sure this was an amazing cake, and everyone who had a slice relayed to me how delicious it was. Update: I made this cake again a year later for the same friend, except for a few minor changes. I decided to use 9″ instead of 8″ pans, which resulted in layers that were about 1″ tall (they were about 1 1/4″ in 8″ pans). 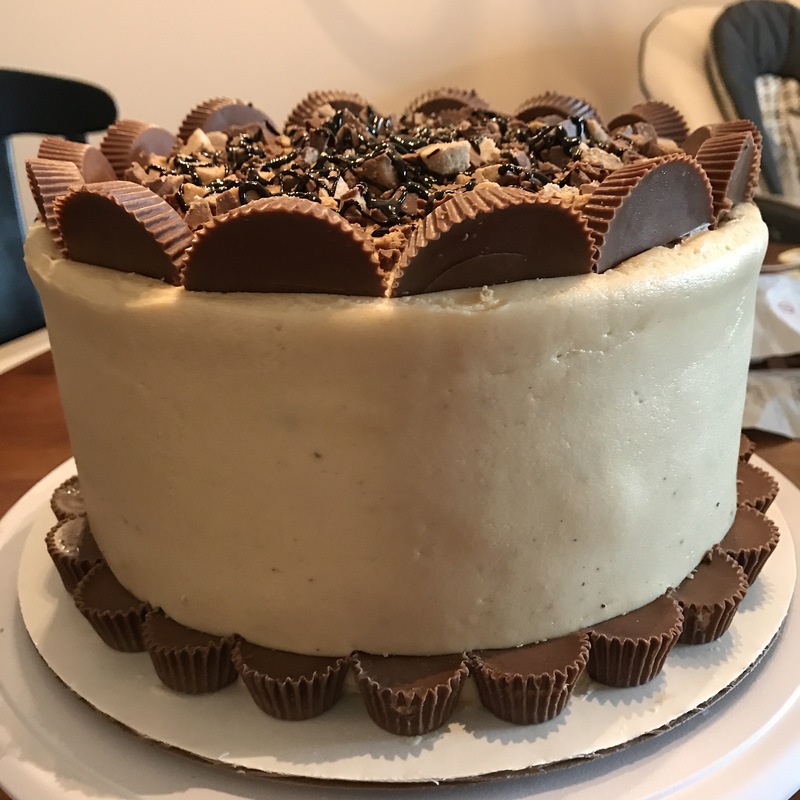 I also chose to use the chocolate-peanut butter glaze included in the reference recipe to try dripping it over the side like so many bakers do these days. I had moderate success, although I think this particular glaze was thicker than optimal but still successful. In the bowl of a stand mixer, whisk flour, sugars, cocoa powder, baking soda, and salt. Add the oil and sour cream, and beat until just incorporated. Gradually beat in the water. Blend in the vinegar and vanilla. Beat in the egg until well mixed. Pour batter into cake pans (~579 g per cake). Bake for 30-35 minutes or until toothpick inserted into the center comes out clean. Allow cakes to cool for 20-30 minutes, then flip onto wire rack to cool completely. For the frosting: In the bowl of a stand mixer, beat cream cheese and butter until light and fluffy. Add powdered sugar one cup at a time until incorporated, scraping sides of the bowl as needed. Beat on medium speed for 3-4 minutes, until light and fluffy. Add peanut butter, then beat until fully incorporated. For the glaze: In the top of a double boiler set over simmering water, melt chocolate, peanut butter, and honey. Whisk often until chocolate is melted and mixture is smooth. Remove from heat, then whisk in half and half until smooth. Use as desired while still warm.